Low Carb, Sugar Free Hot Chocolate Recipe! You are here: Home / Recipes / Beverage / Sugar Free Hot Chocolate Low Carb Recipe! Sugar Free Hot Chocolate Low Carb Recipe! 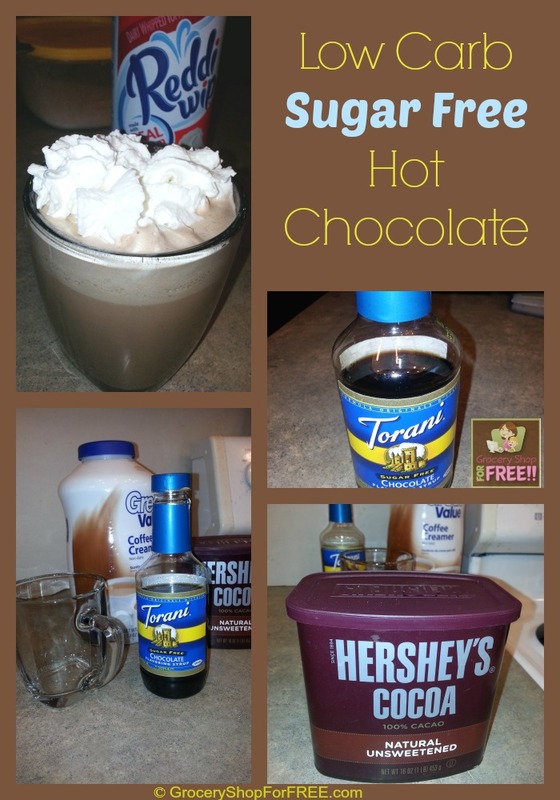 I am going to share my favorite Sugar Free Hot Chocolate Low Carb Recipe with you today. It is one of my favorite things! Who doesn’t love chocolate?! I love having a nice warm cup of hot chocolate in the evening. So, when I had to lose the weight, get rid of sugar, and cut carbs to a minimum, I had to figure out how I could do that without giving up the things that I enjoy. I have found it is much easier for me to continue, after 5 years now, on my weight maintenance plan if I can find substitutes for the things I love. So, instead of giving up on breads and sweets, I have found ways to “rework” them to make them something I can have. I have come up with a simple Low Carb, Sugar Free Hot Chocolate that makes me happy. I thought I’d share it with you! I am not a real “sweet” eater, not just since my weight loss – I have never really been one. So, you may need to adjust the Torani Syrup if it isn’t sweet enough for you, or the creamer if it isn’t creamy enough, but I have found that if I use any more Hershey’s Cocoa it gets a little bitter. There you have it quick and easy, Low Carb, Sugar Free Hot Chocolate Recipe! How much water does this recipe need? For the ingredients I have listed I filled a 16 oz travel cup. But, this one is all about your preference, and since it’s sugar and low carb you can feel free to add more if needed. This recipe does not say how much water to use. You are correct, sorry about that! I use a travel mug with a lid when making mine. But, you would probably need to experiment to get it to the right taste for you, with either more or less water or more or less ingredients. I hope that helps! How much powdered creamer and boiling water? I use creamer to taste – so, I use a lot for mine. I also use a travel size mug and enough water to fill the mug. I add the ingredients before adding the water, it tends to mix more thouroughly and easily. Can I use real heavy cream or half & half in place of powdered creamer ? Not if you’re looking for low carb or sugar free. But heavy cream will work for sure. I have never tried half & half. You’ll just need to adjust the amount you use. There are only 0.4 carbs in a cup of heavy cream. It is low carb and would make the hot chocolate richer tasting.